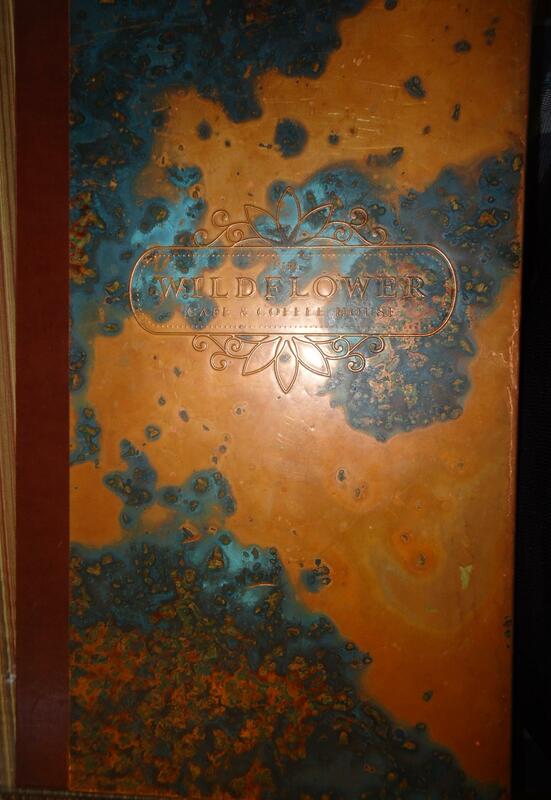 Wildflower Cafe… a welcoming space where you can relax and everything is layered in awesome! So it’s been one year since we started this adventure as the 3Bears with the blog here. This time we gathered together in southwestern Ohio to enjoy some time together focused around going to Kings Island Amusement Park. Tradition brings us to breakfast the following morning at an infamous IHOP location. However fate had other things in mind for some of our friends so we decided on having a foodie adventure to a new location… a new favorite must-stop when in the area place. Those that know us are aware of our love for Lucky’s Cafe in the Tremont section of Cleveland, Ohio. Consider the Wildflower Cafe a cousin that some think is a sister. Again I turned to one of my favorite online site/apps to help locate local foodie hotspots, Urbanspoon.com. 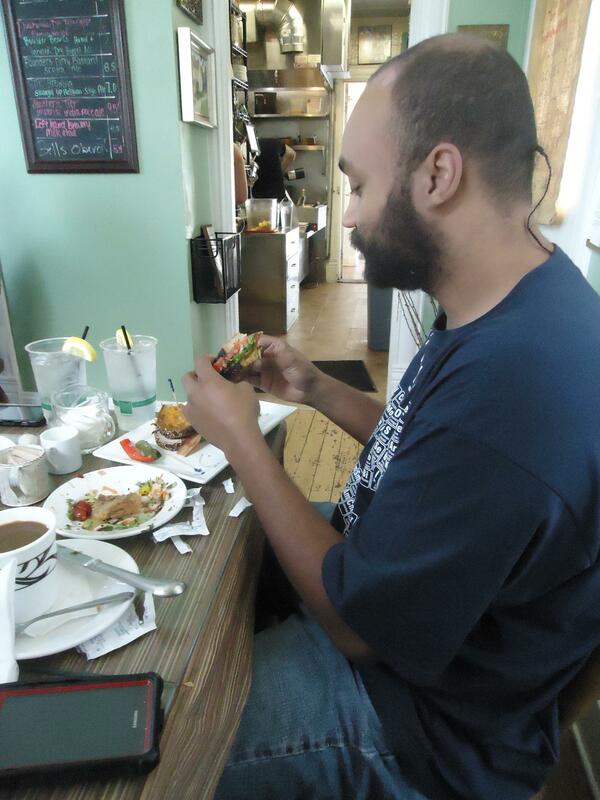 For me, Whiteflower Cafe is a location I knew of a year ago and made a mental note to try and stop in some time. And here an opportunity presented itself. So Drew, William, myself and a new food adventurer friend, David, headed on down the road a mere 5 miles to check out the food that was rumored to be good. Luckily we stayed up late the previous night and slept in a little the next morning because The Wildflower is open only for lunch and dinner. (Although I’m quite certain they could make a killer brunch.) Getting there at Noon, an hour after they opened for lunch, we were able to get a table right away which was great given that the location is a converted house. Think Victorian B&B but the first floor is now dining rooms, bathroom and kitchen; i.e limited but well used space. Our party of four arrived in segments since Garmin decided to misbehave and not allow one of our party to follow directions. However we were blessed with good timing since they were not completed filled up with reservations (which I would recommend in the future to insure a table) and had a couple of tables open when we arrived. The entire home/cafe is well designed to take advantage of the use of minimal space. The entrance is at the rear of the building which open on the entrance way that connects the walk-in cooler, kitchen and main dining room. Yup, the walk-in cooler is placed immediately to the right upon entering and I didn’t think much about it for a while. This was most likely because I have worked in the food service industry and have familiarity with them. Looking back on it though, I image a fair amount of guests would find that different for an experience. My immediate thought is that it puts a higher level of attention to organization and cleanliness given that the guests are going to be seeing this when entering and leaving. We were greeted by the very pleasant Ashlee who proved to be a wonderful waitress and fun person all around. It was agreed upon later during the meal that a person who genuinely cares for their job comes through in their service and does volumes for not only their pocketbook but the business as well. Word to business owners: invest in pleasing personalities and watch the smiles grow! 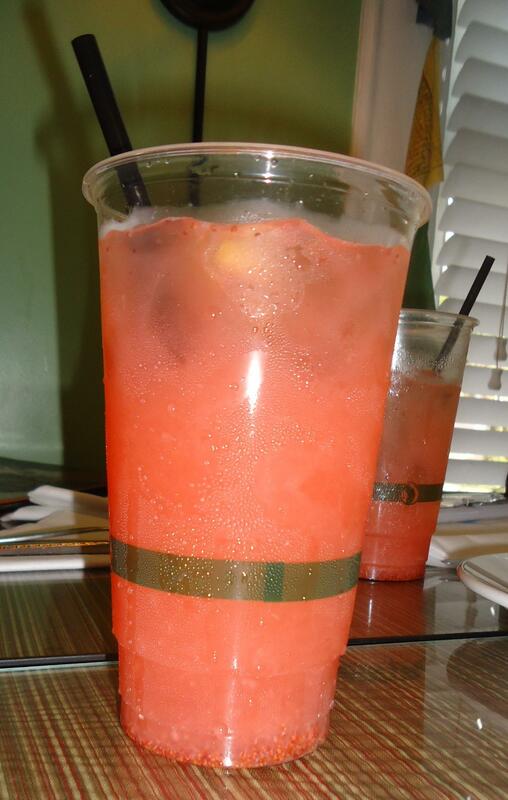 First off we ordered beverages and given the time of day, believe it or not, we went with coffee (the La Terza was found to be highly agreeable by Drew and William) and Strawberry Lemonade, made on premises (David, our guest, and I enjoyed these truly tasty drinks. I personally found this to be not too sweet nor tangy. The freshness was appealing and the free refills being topped off without request made me want to take a gallon jug home to enjoy on a porch swing. Alas I do not have such a porch nor swing. The first thing that stood out to me was the menus when handed out. Heavy in weight and presence, mostly due to the molded copper wrapped around the front cover with the logo on it. The patina was fun and had me thinking about all the non-traditional copper items I’ve seen in my life. As for the food we ordered, the menu is truly enticing on a variety of fronts even though it is limited when some folks are used to the seemingly ‘everything is possible here’ style menus at other locations. This means you have focus and not the endless pages of micro-font that makes you wonder if anything original is possible to order. Which reminds me, William and I had a conversation during our meal in agreement about our preference to order things that we have not seen/had before at other locations. First off, the well portioned and shared apps we ordered. First up, Drew and I were eyeing up the same thing on the menu. I spotted it on the website when previewing the cafe for a destination. 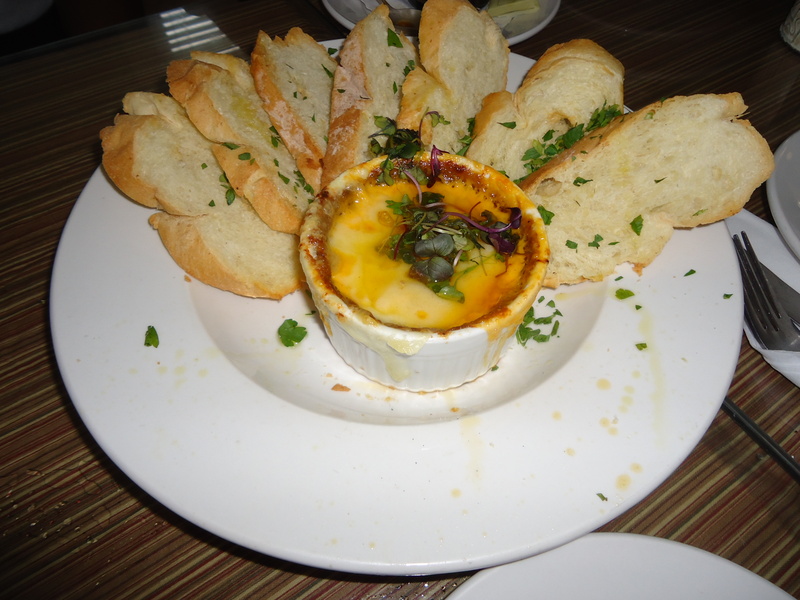 Since we knew two of the four of us were drawn to it, Drew ordered the Truffled Mushroom Fonduta. This has to be one of my all time favs when it comes to earthy, soft and creamy dip/spreads. Being served with a basic, plain Italian bread toasts is a smart move to put all the focus on this crazy good fonduta. Let’s just say that Chef Todd knows what he’s doing when putting together Garlicky Smoked Mushrooms, Gravel Knolls pastured eggs, organic cream and salty feta, baked with Ohio Cheddar and Swiss cheese, and drizzled with truffle oil. There wasn’t a single thing I could find wrong with this dish personally. Let’s just say that gourmet mac ‘n cheese has a distant cousin and they come from a great bloodline of warm, ooey-gooey yumminess! And then we moved on to the main part of our meals continuing the foodie lunch adventure. 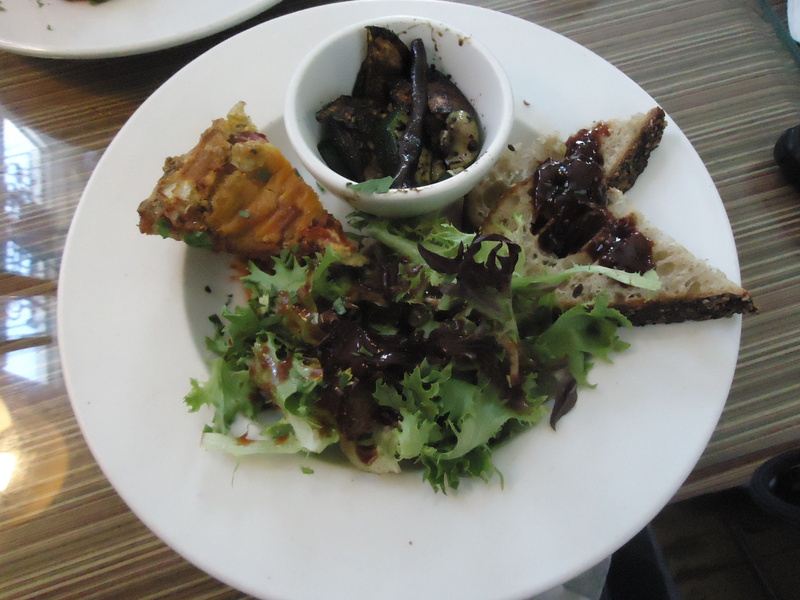 David and I chose the same dish after Ashlee’s ability to enhance explaining the Quiche du Jour. Today’s selection from the Chef brough together sweet red peppers, onions and cheddar cheese. Listed on the menu as Gravel Knolls pastured eggs & organic cream with various vegetables, herbs &/or cheese, served alongside organic spinach dressed in Strawberry Champagne vinaigrette. Potato salad & toasted bread with seasonal “Jam Lady” Jam balance out the meal. 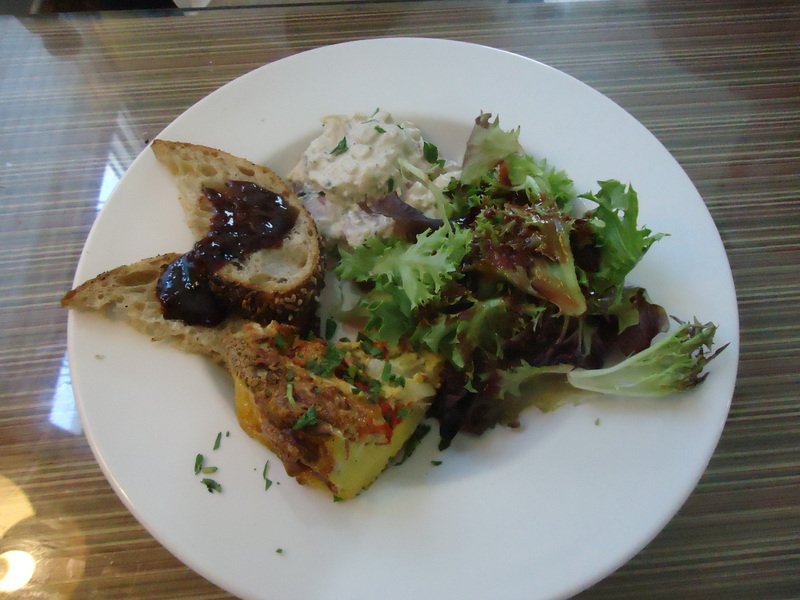 When my dish came out, I was surprised as to the size overall of the plate with a moderate amount of Quiche, lots of greens and a nice small side of cooked zucchini and green beans coated in olive oil and balsamic vinegar, and some of the yummiest bread with local homemade berry jam. Now Drew went the route of ordering their The Pick Two for lunch and chose the salad and soup combo. Let me just say that never in my life have I EVER had croutons this good. Hand to whatever you believe in within the universe, I asked Ashlee our server if they deepfry them to get that crazy crunch. As David stated, they don’t shatter and disappear in your mouth when you bite down. Instead, they crunch with a presence and flavor that says, “I’m here and pay attention boys!” This was the start up of a theme Drew and I recognized with flavors that are built upon each other. The croutons on his salad had a rich taste that brought forward other tastes hidden within them which came forward after the first couple of bites. With the salad, Drew also enjoyed a cup of creamy black bean soup which reminded me of a version I made many years ago while visiting family here in southwestern Ohio. Oh how we were getting full and I think we were considering just skipping a final selection of something sweet. But then Ashlee brought in a piece of flourless chocolate cake for a table nearby and we rethought immediately about getting one more dish. And in a great feat of service mental powers, Ashlee convinced us to not only get dessert, but to order a different dish eash to share around the table. I was personally proud of her for having paid attention to our conversations, picture taking and verbal antics. 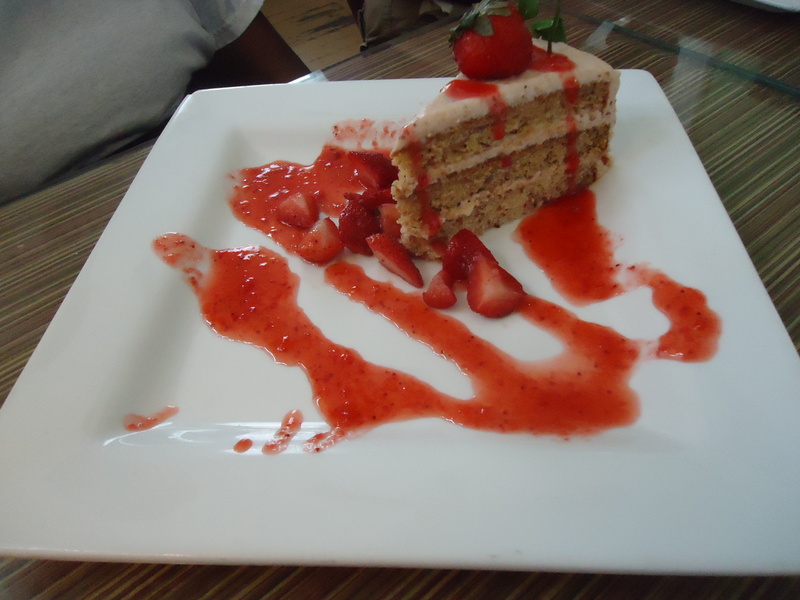 David decided on the Strawberry Cake. Let me just repeat my affirmation that this is NOT your Betty Crocker bright pink batter version by any means. Interestingly for us, I got a different impression of the dish compared to the other three. This had me instantly recalling cool, juicy strawberry shortcake from my childhood. Drew, William and David although all said that they were drawn to how it was like a light spice case enhanced by fresh strawberries not only as a sauce but also within the batter itself. 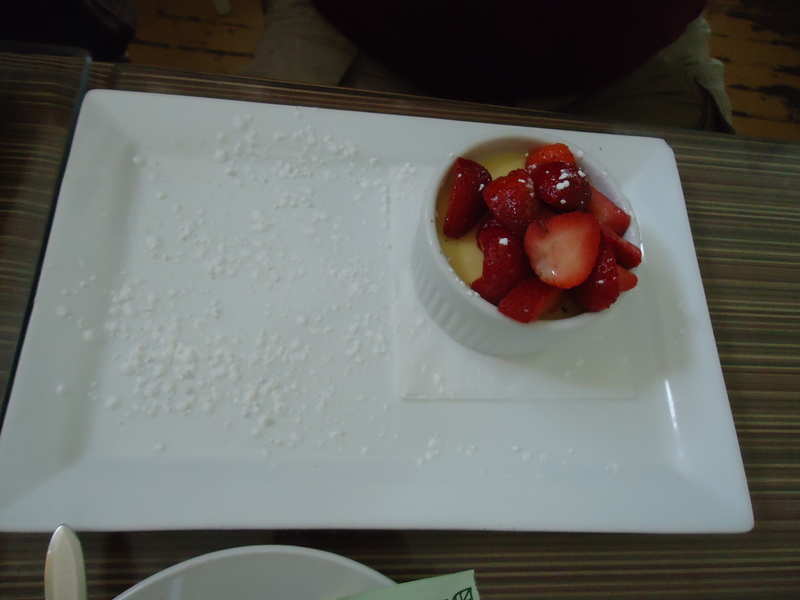 Drew chose the Pot de Creme which brought together eggs, vanilla, cream and strawberries with just the perfect amount of lavender as a soft set custard. This prompted discussion about how tricky lavender can be as a spice; too much and you think you’re eating soap or potpourri. A very tasty dish and perfect for a light ending to any meal. I personally went in a route that is not my usual but my tastes are changing I think. This time I was pleasantly surprised and fell in love with their Chocolate and Pecan Bread Pudding. 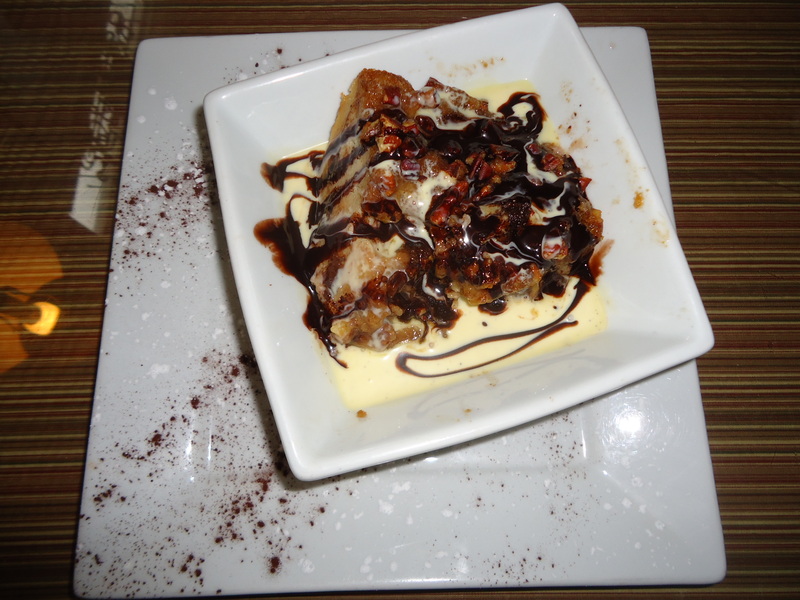 The first thing I noticed about this dish was the luscious smell of creme and chocolate sauces drizzled over top. The second thing I made note of was how soft the bread was as my spoon slowly slid straight through to the bottom of the bowl. And what I mean by this is that it was like putting a knife into room temperature butter, smooth and silky. Now as for the taste, heavenly. Chef Todd did well with this deceivingly simple dish. The portion size is significant and actually too much I would imagine for most. This is not a ‘light finish’ for a meal. It may be airy in texture but definitely filling. So if you find yourself in the area of Mason, Ohio (near the Kings Island Amusement Park and Resort), consider a short drive off I-71 at exit 25 heading West on Kings Mills Road. Take Kings Mills until it ends in a T intersection with Main Street (just outside of downtown Mason). The Wildflower Cafe will be on your right on Main Street with a small amount of parking in the back; although there is street parking as well to utilize. This is one destination the 3Bears look forward to returning to in the future. We recommend having your own foodie adventure with or without us and be sure to tell them we sent ya! This entry was posted in Main and tagged black bean, bread, cake, cheese, Coffee, cream, crouton, dessert, fonduta, jam, lemonade, mushroom, peach, pot de creme, pudding, Salad, smoke salmon, Soup, strawberry, tart, toast, truffle oil. Bookmark the permalink.